IT’S an essential part of the Spanish Christmas festivities and ensures that a lucky few will have a very Merry Christmas and an extremely Happy New Year. Giles Brown picks out some facts and figures about the ‘Fat One’. El Gordo de La Primitiva is one of Spain’s most popular lottery games, best known for its impressive jackpots and the reintegro prize option which increases secondary prizes and is essential to winning the El Gordo jackpot. The draw takes place on December 22 each year at the Teatro Real in Madrid, when Spain comes to a standstill as the numbers are read (or rather, sung) out. It’s been going for a while then? Just a bit. 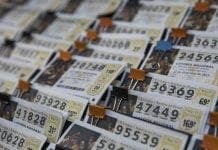 The Spanish Christmas lottery is the second longest continuously running lottery in the world. This includes the years during the Spanish Civil War when the lottery draw was held in Valencia after the Republicans were forced to relocate their capital from Madrid. After the overthrow of the Republican government the lottery continued uninterrupted under the Franco regime up to the present day. 1794 balls for the small prizes, called la Pedrea, literally “the pebble-avalanche” or “stoning”. As the draw goes on, a single ball is extracted from each of the revolving spheres at the same time. One child sings the winning number, the other child sings the corresponding prize. This is repeated until all the prize-balls are connected to a number. Due to the sheer number of prizes, this procedure takes several hours. The children work in about eight to nine shifts, equal to the number of frames of numbers to be drawn. What’s with the singing children? Pupils of the San Ildefonso (formerly reserved for orphans of public servants) draw the numbers and corresponding prizes, singing the results aloud in front of the public. Until 1984 only boys from San Ildefonso participated in the drawing; that year Monica Rodriguez became the first girl to sing the results. It is a custom that the winners donate some of the money to the San Ildefonso school. Spanish TV and radio stations broadcast the entire draw, which takes place on the same December day each year. How much is up for grabs this year? This year there will be 2,240 million euros in prizes. Little wonder, then, that up to seventy-five percent of the Spanish population plays it. What’s my chance of winning? 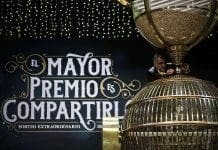 The prize structure makes it easier to win some money compared to other lotteries, and it is common saying that the prizes of the Christmas Lottery are well distributed all around Spain. 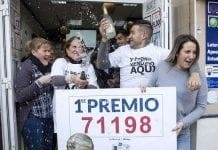 Chances of winning El Gordo are 1 to 100,000, which works out at 0.001%, while chances of winning the top prize of Euromillions are 1 in 116,531,800 or 0.0000000086%. Absolutely. In 2011 two housewives’ associations in Granen, with 2,000 inhabitants, and its neighbouring village of Sodeto in the northern region of Aragon split a record €4 million among a series of tickets. The associations sold shares in the tickets, which are split in a series of 10, to family members, neighbours and friends for €5 each. Each tenth of a ticket was worth €400,000 euros. Not a bad return for a fiver! Are the winnings tax free? They used to be. In an austerity measure last year the government ruled that winners will have to pay 20% tax on any winnings over €2,500. That is in addition to the fact that keeps 30% of the money spent on El Gordo. The €1bn it receives accounts for 0.1% of GDP, equivalent to almost 1% of this year’s budget deficit target. El Calvo was the bald British actor Clive Arrindell, who featured in the Gordo Christmas adverts from 1998 until 2005. There was a general outcry when his mysterious character was dropped. This year’s advert, features Spanish singing stars Montserrat Caballé, Raphael, Marta Sánchez, Niña Pastori y David Bustamante. Clive has revived El Calvo for Accion Contra el Hambre’s Christmas campaign.